SPOILER WARNING: Part three of Borderlands: the Pre-Sequel sees me and Tracy doing a bunch of chores, phoning friends for help, and facing down the person we assumed would be the boss: Colonel Zarpedon. This chapter, Tracy and I hit a hard wall: the levelling wall. Instead of being able to proceed in the story, we found ourselves constantly stymied by complicated level design (imagine Portal 2, but constantly falling to your death), and incredibly hard normal-level enemies that both of us seemed unable to kill. Maybe fighting your way upstream is hard in a two-person game, but let’s not forget: all of the Borderlands entries have been designed for four. Acknowledging that (and the fact that our run had so far been very story-focused), we explored two other features of the Borderlands franchise: sidequests and friends. On the sidequests front… what is there to say, really? Some had the charm that I expected of Borderlands games, but when you’re playing with the intention of racing through the plot, they seem more like distractions. All of a sudden, we found ourselves underlevelled, and unable to continue in the story. Tracy’s experience with this was more frustrating than mine, but we both wanted value in the stream, not just running around and doing random stuff. There are races, some neat side stories, but if you’re in it for the meat of the game, you probably have to be better players than the two of us. We did explore a rather cute side-mission, which involved navigating a complicated map to find a secret area to liberate the spirit of a dead adventurer, and picked up some cool laser weapons on the way: a neat little sidequest packed with Ghostbusters references. Still, though, trying to find sidequests that would be challenging enough to give us experience points that weren’t outright tedious for both travel and length — that became a chore in and of itself. While there are optimal levels for each one, the sidequests don’t really telegraph how long they’ll take to accomplish, or if there are extra steps in the way. One night, we quit out of sheer frustration, because the downloadable character I’d chosen to play (Aurelia) glitched one quest; we’d both have to restart the game to continue. Rather than spend the time optimizing our characters and doing more frustrating quests, we instead chose another option in Borderlands: calling in reinforcements. Our friends Conrad and James jumped in to help us with the next leg of the story, killing Colonel Zarpedon. … And we did it. In an undramatic, two-part fight, Tracy, myself, and our two buddies dispatched the woman we thought would be the main villain of the game. Excuse me? She died super-quickly, and not well, and I’m not sure if anyone else felt good about it. When we started up the next session, Tracy even reminded herself of the “weird alien lady,” who, until the point where we killed Colonel Zarpedon, had not reappeared since the beginning of the game. To me, this seemed like lazy storytelling. And we’ll definitely explore that in the last portion of the game. For now, it was simply demoralizing: we had to call in backup to help us complete an obnoxiously hard and strangely boring part of the game, only to have it conclude without ceremony. Jo: We came upon some hard parts this time! As a newcomer to multiplayer co-op, how did it feel, being underlevelled? At any point, did you feel like the experience would’ve shortened your time with the game, had you been playing alone? Tracy: I was certainly frustrated. It felt like the difficulty curve went way up as soon as you returned to Helios Space Station. We had the deck doubly stacked against us for this part of the run, with being a team of two and below level 20. Not only did the enemies feel much tougher, the level design become more difficult to navigate as well. We joked that the game felt like it turned into Portal 2 for a little while. Though there was no lava to fall into, there were plenty of opportunities to get lost, as well as fall to your death. The trifecta of constant falling, unclear sense of direction, and an under-powered character would have been enough to make me rage-quit if I were playing alone. Jo: We finally brought in some allies for this segment, in the form of Conrad and James. Was playing with a full team of four different than playing with just the two of us? Tracy: A team of four feels like the way the game is meant to be played. We’re not running out of ammo as fast, we’re not stopping every thirty seconds to revive each other. Even though Conrad and James were roughly the same level as us, it still felt like we made a lot more progress, especially during the fight with Zarpedon. Having a variety of skills and special abilities on hand was great as well. One sniper and one (not very good) tank made wave after wave of mobs feel overwhelming. Jo: For this section, we’ve clearly started reaching the beginning of the end. We took out Zarpedon — the apparent villain of the game, but it’s not over yet. How do you feel about this plot “twist”? Are you still interested in the narrative, now that the named boss is gone? Tracy: I’m lukewarm to the story. I know even less about Moxxi and Zarpedon than I do about Jack, so it was hard to feel invested one way or another over their plot to take Jack down. Honestly, I was more concerned for the Destroyer’s eyeball than I was for anyone else! Poor eyeball. Jo: For a couple play sessions now, we’ve actively abandoned the main storyline and done some sidequests. In most games, synthetically raising your level would be labelled as a “grind.” Did you feel like you were grinding out levels? Did 2K Australia and Gearbox do a good job of disguising the grind? Tracy: The grind is effectively disguised through a ton of backstory, not to mention hilarious dialog. I learned a fair amount about Wilhelm through a sidequest, making the game feel like an origin story for him as well as Jack. We also get a chance to hear the characters interact with each other, which is always a treat with Aurelia. Sidequests have an element of discovery that is missing from the main narrative. It’s a pleasure to stumble across a particularly funny line of dialog, or something totally inane like the image of Jack’s holographic head projecting from a tottering robot body. Jo: Almost there! How do you like Wilhelm? Any regrets, before we dive into the last leg of the game? Tracy: I’ve been playing Wilhelm like an Enforcer, but using my skill points on the defensive Dreadnought tree. I think I relied too much on finding stronger weapons to make up the difference, but now that we’re in the endgame it’s time to re-spec. As a character, Wilhelm is a man of simple pleasures — steak, robots, and building his very own robot body. He doesn’t see anything wrong with Jack’s plans or motivations, which works as both bit of character development as well as a subtle bit of foreshadowing. 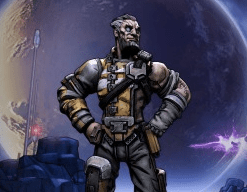 He’s two-dimensional, but Borderlands has so many strong personalities it’s refreshing to find a character as curt and straightforward as Wilhelm. 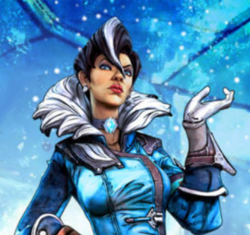 Our Borderlands: The Pre-Sequel! stream runs weekly, at 8pm ET: http://www.twitch.tv/jozerphine. Tracy Flanders: DC-based IT professional. Loves games, especially Bastion and Banjo-Kazooie, but mostly plays Netrunner like a pro. She sings soprano in the Washington Metropolitan Game Symphony Orchestra.